Figure A82. Socorro anomaly, interpreted as the Socorro slab, with (horizontal) [vertical] cross sections through (A)[D] the UUP07 p-wave) and (B)[D] the combined SL2013 and S40RTS s-wave models at 1670 km; C) the location of the modern geological record that we interpret to have formed during the subduction of the slab. The Socorro anomaly (Figure A82) is located below western North America within the mid-mantle. It was first described in van der Meer et al. (2010) and corresponds to anomaly CR-3 of Sigloch and Mihalynuk (2013). The Idaho slab and the Socorro anomaly cover similar depth ranges and dip, and have a more westerly location than the Hatteras slab of the Farallon family. Similar to the Idaho slab we therefore interpreted an intra-oceanic, Jurassic-Cretaceous subduction origin for this anomaly (see also van der Meer et al., 2012). The Wrangellia superterrane of the northwestern North American margin contains terranes derived from both northerly and near-equatorial paleolatitudes according to paleomagnetic data (Nokleberg et al., 2000). In conjunction with our interpretation of the Idaho slab, we associate eastward subduction of Panthalassa/Farallon lithosphere below the southern part of the Wrangellia terranes to have formed the Socorro slab, starting in the Early to Middle Jurassic. Accretion of the terrane to Laurentia started in the Late Jurassic (Trop et al., 2005) and ended in the Early to Late Cretaceous (Nokleberg et al., 2000). 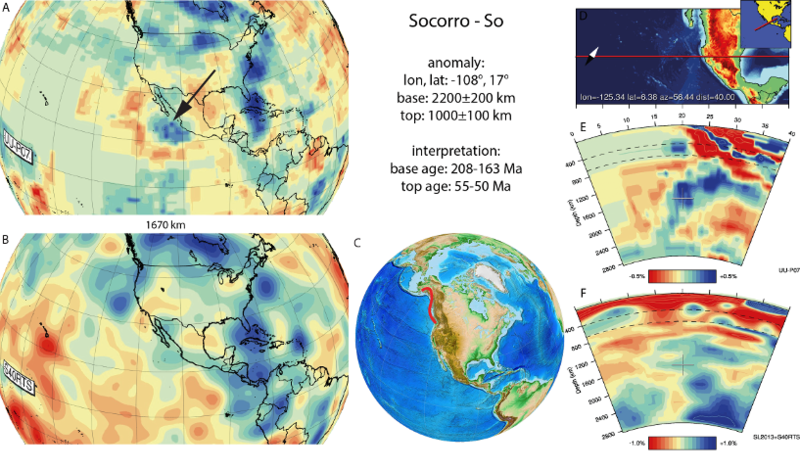 Sigloch and Mihalynuk (2013) inferred that the Socorro slab was overridden by the continental margin at 55-50 Myr, culminating in the Siletzia and Pacific Rim terrane accretions, which we adopt as the age of breakoff.